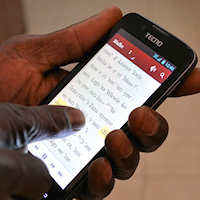 Create customized mobile apps with synchronized Scripture text and audio. Scripture App Builder helps you to build customized Scripture apps for Android and iOS smartphones and tablets. You specify the Scripture files to use, the app name, the fonts, the colors, the about box information, the audio and the icons. Scripture App Builder will package everything together and build the customized app for you. You can then install it on your phone, send it to others by Bluetooth, share it on microSD memory cards and publish it to app stores on the Internet. Apps can be built directly from Paratext and audio files. Launch Scripture App Builder, follow the steps in the New App Wizard and click the Build App button. No programming experience is necessary. 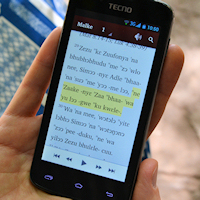 Audio recordings can be synchronized with the text so that each verse or phrase is highlighted as it is read. This is a powerful feature for those learning to read in their language. The apps do not require an internet connection. Content can be packaged together for offline use and distribution, or audio can be made available online. The App Publishing Service helps upload to an app store. You can start distributing it right away via Bluetooth or microSD card to people around you. It can also be made available on the Google Play Store. No. Everything can be packaged inside of the app, meaning that it will need no additional permissions like internet or file system access. However, there is an option to make audio files available online, in which case users would need an internet connection. How do we get the audio-text synchronization to work? You will need to create a corresponding timing file for each audio file. These can be created in one of three ways: (1) using Audacity, a free audio editor; (2) using aeneas to automate the process; or (3) using HearThis to record the audio and produce the timings files for you. Can we build a text-only app or does it have to contain audio? 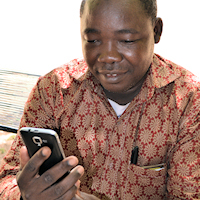 Yes, you can build a text-only app. Audio is optional and the play button will not be displayed in an app without audio.